SOUTHAMPTON’S former Town Champion Billy Castle put in a remarkable performance to win the southern final of the English Amateur Championship. But the 22-year-old from Marchwood (pictured) went down 10-6 to former professional Michael Rhodes (Durham) in the national final the following day. Dad-to-be Castle, now living in Reading, whitewashed Grant Miles (Norwich) with an astonishing scoreline of 8-0 to claim the southern title at Longton Snooker Club, Stoke. He said it’s “amazing” to have his name alongside Ronnie O’Sullivan’s on the trophy and added: “It was a good day. I was playing well. It was unbelievable to win in that fashion. 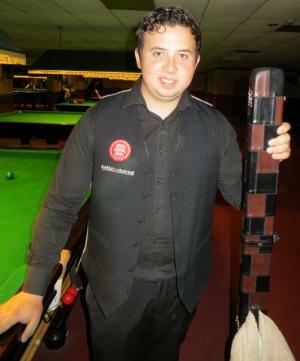 A three-time Eastleigh & District Under-18 champion at Chandler’s Ford Snooker Club, Castle also competes on the Cuestars South of England Championship Tour and won the Finals Day play-off in 2012/13. Former Cuestars member Ben Harrison was last season’s English Amateur Champion.